Carbon nanotubes are hollow carbon structures of varying dimensions that display spectacular material properties. Although they are without a doubt an awe-inspiring achievement of modern chemistry, there’s still plenty of room for improvement. No one has yet developed a method to ensure that the nanotubes are highly precise in both size and composition. Nanotubes are typically formed somewhat uncontrollably, producing a mixture of imprecise tube structures and thus making industrial-scale synthesis and quality control particularly challenging. Exact structures could lead to stronger materials with better optical and conductive properties. To solve this challenge, the authors synthesized the base 3D structure of a tube: a belt. As Figure 1 shows, a tube can be thought of as a large stack of rings or belts. It had been theorized previously that researchers can build nanotubes from the bottom up using these rings or belts as building blocks, but the nanobelt structure has remained elusive until this point (Figure 1A). Figure 1: Examples of nanotubes and nanobelts. Using iterative Wittig reactions followed by aryl-aryl coupling, the researchers were able to form an edge-sharing carbon structure, the nanobelt. The synthesis looks fairly complicated (Figure 2), but can be imagined as hooking small rings together to form a large 3D ring. The reaction starts with the small molecule (3) and adds more small molecules to build up the ring, until it’s finally linked together giving the the brominated structure shown in step (iv). Lastly, the aryl-aryl coupling removes the bromines to form carbon-carbon bonds, successfully completing the belt. Figure 2: Reaction scheme to form the nanobelt. 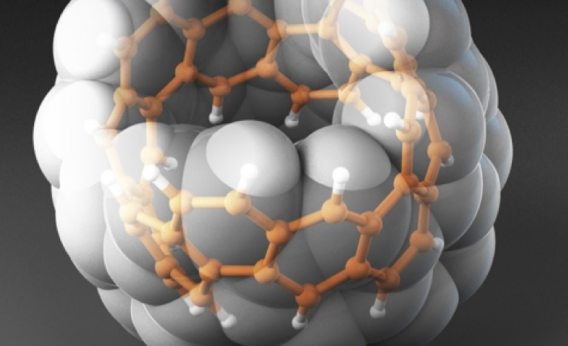 The researchers here have shown for the first time the formation of a carbon nanobelt with edge-sharing benzene rings. This structure can be used on its own for applications due to its unique optoelectronic properties or could possibly be used as a “seed” structure to grow large and precise nanotubes. Controlling the assembly of highly precise structures at the atomic level is a predominant challenge in modern chemistry. As this challenge is overcome, complicated molecular assemblies tailored for specific purposes will become possible to produce, enabling powerful technological advances.